In ages past, hobgoblins and other goblinoids controlled Khorvaire. Over the course of thousands of years a host of goblinoid nations rose and fell. The greatest civilization of this age, the hobgoblin Empire of Dhakaan, bred goblins and bugbears as slaves and warriors. The ancient empire has returned, in a weaker, less infl uential form, in the new nation of Darguun. Darguun, carved from what was once the southwesternmost borderlands of Cyre, contains a variety of environs. Nestled to the east of the Seawall Mountains, Darguun has fertile plains to the north, a dense tropical forest to the east, and a vast moor to the south. The mighty Ghaal River empties into the Kraken Bay and literally divides the nation in half, separating the battlefields of the Last War from the unexplored reaches of the southern shore. For thousands of years the goblinoids lurked in the shadows, hiding deep within the Seawall Mountains and venturing out only to engage in an occasional raid on Brelish or Cyran settlements. It was human greed that finally brought them back into the light. Lord Cail of House Deneith led an expedition into the Seawall Mountains one hundred twenty years ago (878 YK) to seek goblinoid recruits for his mercenary armies. He discovered more than a dozen tribes and clans scattered throughout the mountains. With clever words and a lot of gold, Cail won the trust of a few of the chieftains. A host of hobgoblin warriors and their goblin slaves returned to Breland with Cail. These savage hobgoblins were seen as a novelty; it became prestigious for wealthy aristocrats to employ hobgoblin guards. Then the Last War began. Both Breland and Cyre soon turned to House Deneith to supplement their armies, and Deneith in turn brought ever-increasing numbers of goblinoids out of the mountains. Deneith’s profits soared, but ultimately this reliance on goblinoid soldiers had disastrous results. After seventy years of war, tens of thousands of well-armed goblins and hobgoblins were spread across the Cyre-Breland border. With the rise to prominence of the ambitious young hobgoblin Haruuc, all the conditions for the creation of the nation of Darguun were in place. A cunning tactician and charismatic leader, Haruuc realized that the human and near-human forces in the region were no match for the combined power of the goblinoids. He arranged secret meetings with other chieftains, and through promises, threats, and appeals to racial loyalty he won most of the tribes to his cause. In 969 YK, the hobgoblins turned on the people they were supposed to be defending. Hundreds of humans were slain, while others fled into neighboring lands or were captured as slaves. Haruuc laid claim to the area, naming it Darguun and claiming the title of the Lhesh Haruuc Shaarat’kor—the High Warlord Haruuc of the Scarlet Blade—for himself. Breland and Cyre were completely unprepared for this treachery, and neither nation could spare enough forces to reclaim the land. The King of Breland quickly made a deal with Haruuc, offering recognition in exchange for continued protection along the eastern front, but warfare between the goblinoids and Cyre continued right up until the Day of Mourning (see The Mournland for details). Eager to put an end to the war, Karrnath, Aundair, and Breland formally acknowledged the sovereignty of Darguun with the Treaty of Thronehold. With clearly delineated borders defining the new nation, Lhesh Haruuc swore to restrain his followers from future violence against the three nations. Thrane, however, has demonstrated disfavor with the Darguun accords, and the knights templar of the Silver Flame may yet seek to avenge those killed in the original uprising. In general, most nations see the presence of Darguun as a necessary evil. Far more goblinoids were hidden away than most people thought possible, and since the rise of the nation many tribes have migrated from other parts of Khorvaire to claim a place in the new hobgoblin domain. Weakened by the Last War, the Five Nations have neither the energy nor inclination to battle the goblins. For their part, the goblinoids have abided by the terms of the treaty. House Deneith has reestablished relations with Haruuc and with a few of the tribes now residing within the nation and swearing fealty to Haruuc. Three questions remain: Will Haruuc be content developing the territory afforded him by the agreements of Thronehold? Can he actually keep the many goblinoid tribes that have flocked to his banner under control? Will he seek to reclaim the glory of ancient Dhakaan? Between the mines of the Seawall Mountains and the plains of what was once southern Cyre, Darguun produces enough ore and grain to meet the needs of its population. It engages in relatively little trade with its neighbors, primarily exporting warriors through its deal with House Deneith. The dragonmarked house acts as a broker for the goblinoid mercenaries, selling their services across Khorvaire. The mercenaries, in turn, report back to their leaders in Darguun with news and information on the lands beyond their borders. Darguun consists of three regions: the Seawall Mountains, the northern plains, and the southern wilderness. Most of the nation’s population lives in the mountains and along the two major rivers, the Ghaal and the Torlaac. The nation is home to three major goblinoid tribes and the various clans associated with them. These tribes are the Ghaal’dar clans of the lowlands, the Dhakaani clans who rule the mountain depths, and the highland clans of the Marguul. empire, and it plots a return to goblinoid glory. Travel through the mountains is difficult; there are few established paths, and the mountain goblins are generally hostile to members of the common races. Travelers on authorized business can obtain a banner of safe passage from tribal leaders, but most tribes don’t recognize the authority of other tribes. A banner from the Lhesh Haruuc, whose stronghold is the capital of Rhukaan Draal, provides some protection, but even it doesn’t guarantee complete safety when traveling through the territory of the highland or Dhakaani clans. Many of the tribes keep slaves drawn from the common races, including humans and gnomes. These slaves are captives taken during the Last War, and the chieftains continue to look for new sources to refill their slave pens. The northern plains of Darguun were once part of Cyre. Here, the goblins and hobgoblins have taken possession of cities and villages once occupied by the common races of Galifar. Many of the structures were devastated during the Last War and have been patched together according to goblin sensibilities. The net effect creates a society that appears ramshackle and shabby. The Lhesh Haruuc commands the lowland tribes, using kobold slaves to farm the land and harvest the food to feed his subjects. Tribal conflicts are still common, but travelers who hold a banner of safe passage from the Lhesh Haruuc are usually protected from aggression. The southern reaches, including the Torlaac Moor and the Khraal rain forest, are wilder and less settled than the northern portion of the nation. Most of the goblinoid settlements in this region can be found along the Torlaac River, with few outposts deeper in the wilderness. Darguun is a volatile nation. The Ghaal’dar tribe makes up the majority of the population, and most of the clans in this tribe yield to the authority of the Lhesh Haruuc. They follow because they respect Haruuc’s leadership and military power. Should either of those factors change, Darguun could quickly collapse into chaos and anarchy. As it is, Haruuc has little control over the mountain tribes. The Marguul and Dhakaani clans usually ignore royal edicts, and even the Ghaal’dar clans often fight one another despite Haruuc’s orders to work together. For his part, Haruuc seeks to reshape goblinoid society to match the model of ancient Galifar. Haruuc wants to create a stable realm for his descendants, but he fears that with his death the nation will fall victim to infighting and ambitious clan lords. He has established a great court at Rhukaan Draal, and representatives of all the clans and tribes can be found there. But despite Haruuc’s best efforts, military might remains the only force the goblinoids respect, and he frequently has to use this power to quell disputes and drive through his edicts. At this point, the goblinoids have little to offer the other nations aside from their soldiers. Many of the dragonmarked house leaders distrust Haruuc, and so are reluctant to commit too many resources to Darguun. While all of the houses maintain outposts in Rhukaan Draal, their members are rarely found elsewhere in the realm. House Deneith: The rebellion of the goblinoid mercenaries in 969 YK was a terrible embarrassment for House Deneith. Nevertheless, the leaders of the house have since established a strong relationship with Haruuc. The hobgoblin warlord appreciates the legitimacy he gains through the association, while House Deneith needs the mercenary troops Haruuc provides. In addition to its outpost inside Rhukaan Draal, House Deneith maintains a fortress a short distance away from the capital city. Known as the Gathering Stone, this fortress serves as a staging area and training center for mercenaries who have agreed to serve the house. House Tharashk: The prospectors of House Tharashk have taken a great interest in the potential mineral wealth of the Seawall Mountains since the end of the Last War. Unable to reach agreement with Zilargo to mine from the western side, agents of the house have been negotiating with the goblinoid tribes to approach the mountains from the east. However, the orc heritage of Tharashk works against this plan; many of the hobgoblin leaders harbor strong prejudice against the orcs. House Tharashk has established an outpost in Rhukaan Draal in hopes of strengthening its position in the kingdom and reaching an agreement that proves benefi cial to all sides. Goblinoids (general): Each of the three goblinoid tribes is multiracial and consists of goblins, hobgoblins, and bugbears. It isn’t too unusual to find members of other races among the tribes. Some of these have embraced the goblinoid traditions and fought for a place of honor within the clans. Others are slaves, working for the benefit and amusement of their goblinoid masters. Rhukaan Taash (Razor Crown): Rhukaan Taash, the largest and most powerful of the Ghaal’dar clans, rules over the lowlands. While the clan possesses many skilled warriors, its greatest strength is its vast numbers. Individually, Rhukaan Taash warriors are no match for the soldiers of the Dhakaani clans, but collectively they make up a force that can’t easily be threatened. This clan has been loyal to the Lhesh Haruuc since the hobgoblin led the goblinoid revolt twenty-nine years ago, but not every member of the clan is completely content. While Haruuc has sought to consolidate his power and earn legitimacy for Darguun, many of the lesser chieftains feel that the goblinoids should continue to expand the nation. Some have even urged preemptive attacks on Breland and Zilargo, arguing that the humans and gnomes will one day come for them if the Rhukaan do not strike first. Such views shall undoubtedly cause trouble in the future, especially after Haruuc’s reign ends, whether he falls from power or eventually dies of old age. For now, it is just another thing for the warlord to contend with. trying to preserve a bloodline. Most hobgoblin mercenaries employed outside Darguun belong to Rhukaan Taash or one of the other Ghaal’dar clans. A distinctive ring of scars encircles the head of each Rhukaan Taash warrior, just above the eyes. This identifying mark is the result of painful initiation rituals each warrior goes through to prove his worth and readiness for adulthood. Kech Shaarat (Bladebearers): The Bladebearers, named for a powerful artifact in their possession, are the largest of the Dhakaani clans. For thousands of years the Dhakaani clans have isolated themselves from the rest of the world, but they see the rise of Darguun as the fi rst sign of a restored Dhakaani Empire. Now the clans have emerged from their fortress caverns and are partaking in a brutal struggle to determine the rightful heir to the imperial throne. Since these battles are confined to the depths of the Seawall Mountains and do not involve outsiders, the Lhesh Haruuc has paid little attention to the conflict. But if one leader can win the loyalty of all the Dhakaani clans, he could challenge Haruuc for control of the Darguun nation. Chieftain Ruus Dhakaan (LN male hobgoblin, fighter 13) seeks to prove his right to rule through conquest. Kech Shaarat has already absorbed two smaller clans, and it seems only a matter of time until Ruus has all of the Dhakaani forces under his control. He outwardly bows to the Lhesh Haruuc’s authority, but in his mountain lair considers his own word to be more powerful than that of the lowland pretender. His soldiers rarely leave the Seawall Mountains; they can be identified by sword-shaped brands on one or both forearms. Kech Volaar (Wordbearers): The Wordbearers have gone to great lengths to preserve the lore of the Dhakaani Empire. Though Kech Volaar is one of the smallest Dhakaani clans, its armorers and stonemasons are unmatched in all of Darguun. This great skill has allowed their fortifications to hold against Kech Shaarat and other aggressive clans. Led by Tuura Dhakaan (N female hobgoblin, bard 9), the strongest dirge singer the clans have seen in over a thousand years, the Wordbearers keep the memory of the ancient goblinoid empire alive. Instead of seeking conquest through military victory, Tuura intends to prove her right to rule by gathering the lost artifacts of the ancient empire—both to serve as a symbol and to provide her with enough magical power to overcome her foes. Kurac Thaar (LN male hobgoblin, fighter 8), the clan’s warlord, is as fanatically devoted to Tuura and her vision of the restored empire as the rest of Kech Volaar. Kech Volaar goblinoids often venture beyond Darguun in search of Dhakaani ruins, but they do not work as mercenaries. They rarely interact with other races except in the pursuit of a mission. Symbols depicting important events are often tattooed on members of the clan; those who read Goblin can learn much about an individual through the study of these markings. Kalkor: The Marguul tribe consists of an alliance of bugbear-led clans that live in the highlands of the Seawall Mountains. For the most part, the Marguul clans pay homage to the court of Rhukaan Draal, benefiting from Darguun’s ties to the outside world. However, one Marguul clan, Kalkor, refuses to bow to the hobgoblin Haruuc. Led by Mograath (NE male bugbear, fighter 7/rogue 3), Kalkor is not the largest Marguul clan, but its members are easily the most vicious. Dedicated followers of the Mockery, Mograath and his warriors represent a threat to anyone who travels through the Seawall Mountains—especially those carrying a banner of safe passage from Haruuc. Gruesome facial scars displayed in a fang pattern distinguish members of the Kalkor clan. Traditionally, the goblinoids worship either the Shadow or the Mockery. Over the last century they have been introduced to the other gods of the Sovereign Host. The Lhesh Haruuc follows the teachings of Dol Dorn and has done much to spread the worship of the Sovereign Host among the lowland tribes. Temples dedicated to Dol Dorn, Dol Arran, and Balinor can be found in the city of Rhukaan Draal. The lowland goblinoids live in the rebuilt ruins of old Cyre towns, while the highland and mountain tribes live in natural caverns or simple longhouse communities. The larger Ghaal’dar clans and the Dhakaani clans have their own capitals, but one major city dwarfs all others: Rhukaan Draal, the capital of Darguun and the headquarters of the Lhesh Haruuc. Rhukaan Draal (Metropolis, 82,460): The heart of Rhukaan Draal was once a frontier Cyran town; over the last two decades it has grown into a sprawling goblinoid metropolis. Rough yet functional Ghaal’dar architecture creates a city of patchwork styles and materials. The most impressive structure is the royal palace; dissatisfied with the work of his kindred, the Lhesh Haruuc hired the stonemasons of House Cannith to build his home and fortress, called Khaar Mbar’ost, or Red House (literally, “blood-colored fortified dwelling”). This ten-story tower of red granite dominates the skyline of Rhukaan Draal. The laws of the city are simple, and the hobgoblins take little interest in the history of their guests. As a result, many criminals fl ee to Rhukaan Draal to avoid justice, and smugglers can freely sell goods in the marketplace that would put them on the wrong side of the law in Breland or Thrane. Volaar Draal (Small City, 8,360): Thousands of years ago the Dhakaani clans carved their fortresses into the roots of the Seawall Mountains. Volaar Draal, the stronghold of the Kech Volaar clan, is hidden deep beneath the peaks and crags. Its vast underhalls contain fungus fields that produce food for the city, forges for armorers, libraries and vaults to house the relics of the empire, and a great cavern in which Kech Volaar troops perform battle drills. The stonework easily matches the best the dwarves of the Mror Holds can produce. Few outsiders are allowed to visit these wondrous vaults. Wyvernskull (Small Town, 1,100): A port town at the mouth of the Torlaac River, Wyvernskull sits on the edge of the Khraal rain forest. This haven in the midst of the wilderness provides an important entryway into the kingdom for the few traders that approach Darguun from the southern seas. If trade ever increases, this town would blossom. Until then, its inhabitants eke out an existence as they wait for the infrequent but necessary trader visits. 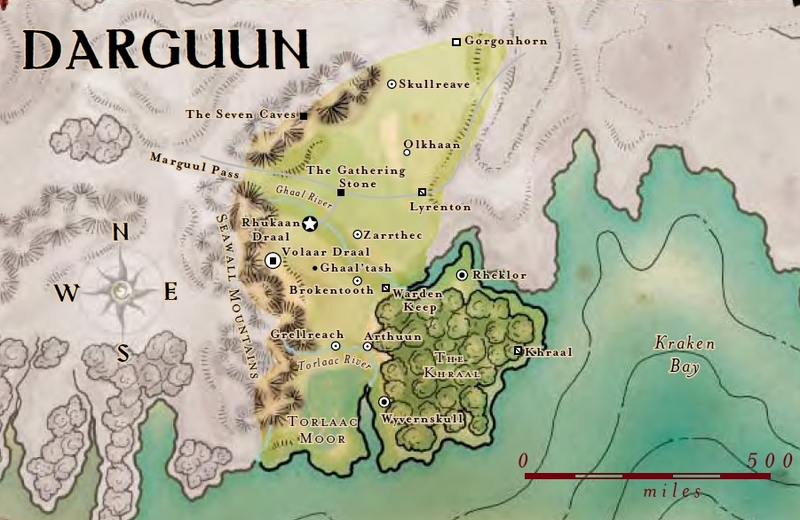 Gorgonhorn (Fortified Village, 700): Gorgonhorn occupies the last stretch of habitable land in Darguun before the blight of the Mournland swallows all light and life. The goblinoids that live within this fortified village patrol the border and watch for incursions. Once, those incursions came from Cyre or Breland. Now, the defenders of Gorgonhorn keep an eye out for monsters and worse things that often slip out of the Mournland and threaten Darguun’s northern plains. of ruins remain—some seized by the goblinoids, others shunned for the curses, ghosts, or other horrors that haunt them. Lyrenton: One of the shunned locations, this devastated Cyran town on the border of the Mournland is believed to be cursed. Any who visit the place are said to quickly fall prey to a wasting disease (inhaled; DC 18; 1 day; 1d3 Str and 1d3 Con). Even if a visitor can withstand the strange illness, the place seems to draw horrors from the Mournland the way an everbright lantern attracts moths. At night a terrible wailing echoes among the ruins and can be heard for miles across the plains. Warden Keep: This House Deneith prison was used during the height of the kingdom of Galifar to contain some of the worst criminals given over to the care of the Defenders Guild. Converted into a fortress during the Last War, the place was used by the Cyran army up until the Darguun revolt. The keep, still largely intact, became a tomb for the Cyran forces when Haruuc and his forces laid siege to the place. The Cyrans refused to surrender or flee, and so were surrounded and cut off from supplies and outside aid. The two thousand troops died slowly of starvation and growing illness as Haruuc simply ordered his troops to watch and wait. Today, the goblinoids shun the keep, believing it to be haunted by the last Cyran troops to fill its ancient battlements. The Torlaac Moor: This expanse of blasted heath and stone runs along the eastern base of the Seawall Mountains. Ruins from the time of the Dhakaani Empire are believed to dot the moor, and subterranean dungeons hide beneath the mire. Members of the Kech Volaar clan have spent a great deal of time exploring the area, but the moors are vast and hide their secrets well. The Khraal Rain Forest: The Khraal rain forest fills the eastern spur of Darguun. Within its dense depths, all manner of strange and dangerous creatures roam. An extensive series of ruins, believed to be from the time of the Dhakaani Empire, lies deep within the vibrant jungle. A few towns and villages can be found along the edge of the great jungle, but not even the most powerful hobgoblins or bugbears have been brave enough to try to forge settlements within this dangerous environment. The Seven Caves: One of the highest peaks of the northern Seawall Mountains, Pargon’s Peak contains a network of remarkable caves said to contain a part of the draconic Prophecy. The Seven Caves, as the Dhakaani and Marguul clans call them, consist of seven huge vaults that seem to be magically dug from the living stone of the mountain. From the First Chamber that can be reached from a cave opening high in the mountain, to the Seventh Chamber that plunges toward the very bowels of the world, the Seven Caves are wondrous and awe-inspiring. Inside each strangely shaped cavern, amazing dragonmarks glow and swirl across the walls, floors, and ceilings. Each cave, in theory, reveals a different series of omens and portents, but few among the goblinoids have the courage to brave these sacred vaults to study them. Anyone who does attempt to enter the Seven Caves must contend with the wyvern colonies that regularly use them to nest and raise their young. House Orien runs trade roads that connect Rhukaan Draal to Thrane and Breland. The roads are relatively safe for the Orien caravans and their Deneith guardians, but other travelers use the roads at their own risk. Anyone who intends to travel outside the capital city is advised to obtain a banner of safe passage from the Lhesh Haruuc’s authorities at the royal court. Travelers are required to explain their need for the banner, and a fee is levied based on the purpose of the visit. Typically this amounts to 100 gold pieces, but prospecting or relic-hunting expeditions may incur greater fees. The pattern of the banner changes on a monthly basis, so adventurers cannot simply keep an old banner to maintain permanent safe passage. In fact, displaying an out-of-date banner usually provokes attacks by hobgoblin and bugbear raiders. In general, however, a valid banner from the Lhesh Haruuc prevents random violence and allows travelers to engage in business with the tribal communities. Even for those with a banner of protection, Darguun can be a violent and unpredictable land. Brawls and bloody conflicts are a part of life among the Ghaal’dar clans of the lowlands. A banner keeps an adventurer from being singled out as a target, but it won’t protect him if he provokes a conflict or causes trouble. Darguun is a frontier nation. The people in the smaller villages know the government is out there and respect the idea of the law, but if a stranger insults you, it’s time for a showdown. As a general rule, the Ghaal’dar clans are unfriendly toward outsiders and hostile toward half-orcs and elves. There has long been enmity between the goblinoids andthe orcs, and more recently the elves of Valenar have been raiding Darguun from the sea. Possession of a valid banner of safe passage improves the attitude of the locals by one step. The northern plains have few wandering monsters, except along the Mournland border. The goblinoids themselves, however, are suspicious and dislike strangers, so they pose the greatest danger to visitors. The mountains and southern wilderness are a different story. In addition to the highland tribes, the mountains are home to all kinds of monsters. The moors to the south have their share of dangerous creatures, though natural hazards can be even more deadly in that harsh environment. The jungles of Khraal teem with deadly creatures, and even the bravest hobgoblins and bugbears refuse to venture too deeply into its dark interior. Adventures of all sorts abound in Darguun. Explorers can crawl through the many ruins that dot the land. Remnants of ancient Dhakaan can be found in the Seawall Mountains and among the lowland moors and jungles. More recent Cyran ruins remain, as well as older structures dating back to the height of the Galifar kingdom. Conflicts and intrigues involving the various goblinoid clans make for exciting adventures; the possible unification of the Dhakaani clans would certainly concern the King of Breland, and the Library of Korranberg is always on the lookout for historical knowledge to add to its storehouses. Otherwise, untapped mineral resources await discovery in the Seawall Mountains, and there are those who will pay well to either shore up or tear down the Lhesh Haruuc and his dream of a unified Darguun. Finally, the law holds little power in Darguun, and this lack of rules and regulations can drive adventures. Rhukaan Draal serves as a sanctuary for criminals and fugitives of all sorts, so it isn’t unusual for adventurers to wind up with jobs that take them to the Darguun capital in search of those who have escaped justice in the Five Nations. Likewise, if a party requires illicit goods, blackmarket items, or hirelings with a penchant for breaking the law, the trade exchanges and taverns of the capital city are good places to look. —A necromancer of the Order of the Emerald Claw establishes an outpost in the Torlaac Moor, seeking to draw on the remnants of ancient battles to create undead mind flayers. —A dangerous fugitive wanted by the Citadel of Breland, Knights of Thrane, and the Aurum is hidden somewhere in Rhukaan Draal. If the Aurum locates him before the forces of law, the consequences could be dire. —A strange and dangerous alchemical substance is traced to the markets of Rhukaan Draal. —The Lhesh Haruuc wants to hire a group of nongoblinoid spies to investigate the activities of the Dhakaani clans. —Raiders have been harassing human settlers near the border town of Kennrun, a village on the Breland border with the Mournland, not far from the Darguun village of Gorgonhorn. Are the raiders really from Darguun, or is the goblinoid nation being framed? —House Orien needs guards-for-hire to protect the next trade caravan traveling from Breland to Rhukaan Draal. Lately, the highland tribes have been harassing the passing caravans as they come through Marguul Pass, so House Orien wants to add a little muscle to discourage further attacks. —Tuura Dhakaan, leader of the Kech Volaar clan, puts out a call for adventurers willing to brave the Khraal wilderness to recover a relic from the age of the goblinoid empire. Tuura possesses an ancient map that shows the location of the site, but she is reluctant to send more of her own clan-mates into the dangerous forest. —Emissaries of the Lhesh Haruuc seek to hire adventurers brave and strong enough to deal with a monstrosity that has emerged from the Mournland. It has already destroyed three patrols from Gorgonhorn and threatens the farming villages of the northern plains.